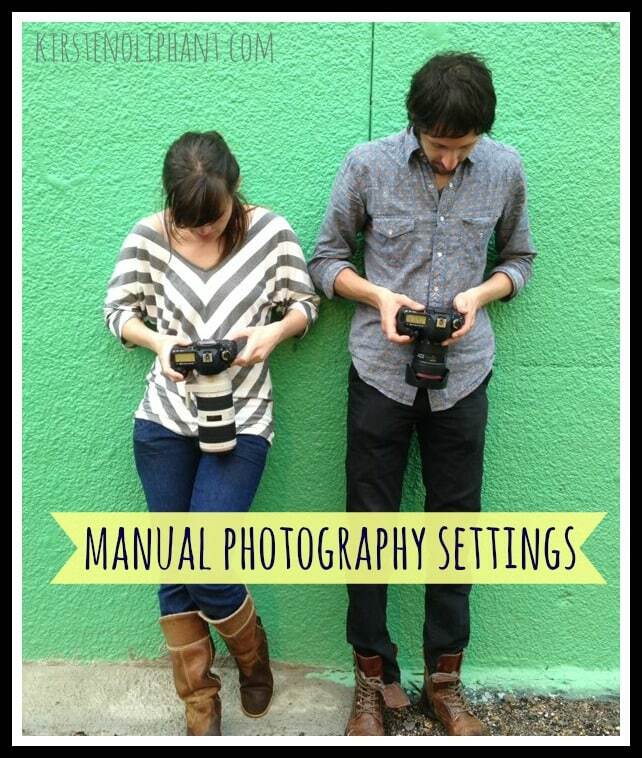 Last week, I had the first of two posts on Manual Photography Tips from Bonnie at Two Creative Birds. Her advice was thorough, practical, and great for people still figuring out those pesky DSLR settings. (Like me.) She’s back this week for more. Please check out her site and Facebook page. Send her some love and ask any questions you have! Subscribe for more great content from Kirsten Oliphant in a once-weekly email! Don’t be afraid to get in close to your subject. You don’t always have to have their entire outfit immortalized in the photograph. The picture is a lot more powerful if their expression fills the frame rather than seeing them, the TV, the laundry basket, your husband coming around the corner and the evidence that you were too tired to clean the kitchen last night in the background. Look at that beautiful oak tree! Let’s shoot cute pictures of the kids under it in their Easter clothes! While this is potentially a great idea, there’s a really good chance this picture is going to be awful. Those beautiful leaves are putting awful shadows across half of their faces. Don’t do it! Move them until you find an even light, especially if you don’t have an off camera flash to work with. So now you have them in complete shade, PERFECT! But it STILL looks a little flat and their eyes are super dark. No problem, grab a reflector! You don’t need a professional reflector to do the job. A white poster board, a white pillow case and often times even a silver cookie tray will let you bounce enough light from the sun onto their faces to get a beautiful light and sparkle in their eyes. Don’t have any of those things handy? Look around you…is there a white wall that could bounce the light, or a concrete sidewalk? Keep your subject shaded but near concrete and the sun will bounce the light for you! Hey! Let’s go shoot in the middle of that open field. But stop squinting! Getting your kids to stop squinting is nearly impossible so you may need to take one for the team in this location. Put their backs to the sun or keep the sun at a 45 degree angle to them if they aren’t still squinting at that spot. With a low ISO, a super high shutter speed and a low aperture, example ISO 100, 1/2000th, F 2.8 you should have no problem getting perfectly lit, squint free pictures. Let’s go inside now. The kids always look so sweet playing with their toys in the game room but every time you take their pictures, half the room is dark and half is light. So let’s move them around. If their faces are facing the window and your back is to the window you should have lovely light evenly balancing them as they play. If it’s too bright, throw up a white, sheer curtain to soften the light. My guess is you’ll probably need a pretty high ISO, slower shutter speed and lower F to pull these shots off. I would start off experimenting around ISO 800, Shutter 1/250th, F4. Get a white pillow to place below them to bring in more light but I don’t recommend taking your shutter lower than 1/200th. Which face do you want to remember when your cutie turns 17 and isn’t so “cute” anymore? The forced cheese smile or that silly laugh you wish you could hold onto forever? If your kids are younger, chances are, you have all the secrets you need to make them laugh while you’re shooting them. But when your sweet 3 year old turns 9 and doesn’t think you’re as funny as you used to be, you’ve got to call in the big guns. Time to think. What is Jimmy never ever ever allowed to do? Destroy his room with a big ol’ mess? Jump on the couch? Play in the mud and track it through the house barefoot? The big perfect smile is hidden in two places here and you don’t want to miss either of them. Sit that grumpy, photo avoiding kid down. Get your camera ready and announce to him that you are about to let him unleash his wild side without getting his Nintendo taken away. Click away as his grumpy face goes from a scowl to a little confusion to a moment of sheer joy that you never thought you’d see again when his friends weren’t around. Then, let him do it. Get over your own hesitations. You can clean the dang floor later. But trust me, you’ll want that devilish grin caught on camera for the rest of your life. Then get in close and really catch him laughing as he jumps on your bed and pours water on his dad’s head….while dad is in a suit! Trust me parents, it’s worth your own pains to gain these memories. The next problem is that grandma doesn’t want the muddy face shot. She wants just one picture, just ONE, where your 13 year old looks like she likes her 8 year old brother. Not just where she smiles a fake smile but where she actually really looks like she likes him. Here’s where you have to use your best judgment. If the siblings are like clinically mean, awful people who’s dreadful future you can already predict, this may not be a safe one for you. But you know your kids. Have them sit together, tell them to whisper something mean to each other at the same time. The joy of being able to call their siblings a big old dummy for one second will forever look like siblings who couldn’t be happier to be together on camera. I’ve never had this one fail me. It’s a genuine smile and not the forced one they give just to earn the reward you promised to give IF they smile. Extra sensitive siblings that may take this to heart too much can try the bad worth method instead! They say them anyways when we aren’t with them and one small little vulgar word will equal one big beautiful smile. Another trick is to get them talking. Ask questions that make them think and laugh and then shoot the whole time they are talking. Sure you’ll have a lot of funny expressions to throw out, but when you’re going for the perfect expression, it is okay to have a zillion to dump. With all of these great tips comes one flaw. Where’s mom…..or dad as the case may be? After you’re long gone, it’s more than their cute faces they’ll want to remember. They want to see what mom looked like 30 years ago. What expression did you have when you watched them being silly? Don’t deprive them of those important memories just because you hadn’t dropped your baby weight or you hate your smile. They won’t see those things. They only see you, the mother who is now 85 years old but was once young enough to pick them up and throw them in the air. Grab a friend to take pictures of you with the kids. And once in a while, do it with quality and call a professional photographer who has all the manual photography tips you need in their bag to capture your family as they are now…when life is JUST as it IS. Bonnie and Gabriel, Two Creative Birds are a Houston, TX based photography husband and wife team who spend their time capturing families with all of their quirks and stories that make them special. You can see more of their work at Two Creative Birds and Bonnie Al Rifai. Lovely tips buddy. your photography tips help me. Thank you for sharing such great tips. Your article is also well written i appreciate your write.